For small arts colleges in the cyberpunk dystopia, there’s a choice to be made between being free of any corporate influence, and dead broke, or climbing onto that gravy train of research into how to better control the world. Rules about not interfering with developing life-forms are a fine idea, but when you finally find some folks who are almost at the point where you could talk to them, and there’s a threat inbound that they can’t deal with on their own, what do you do? Who is framing the spider for Miss Muffet’s mysterious murder? 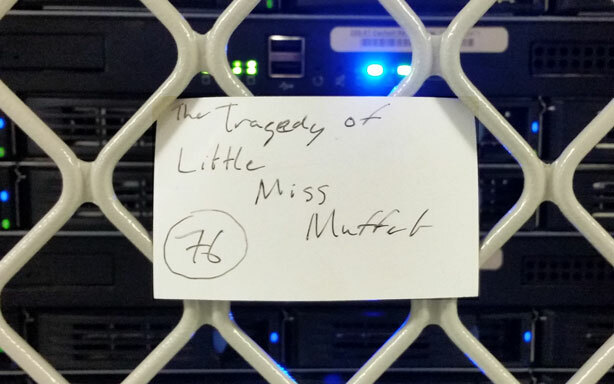 Miss Muffet lies dead at the Muffet Estate, and the assembled guests must determine which of them is the murderer. Cyberpunk cities are bad enough, with the side-effects of corporate actions clearly visible in the streets and alleyways. But what’s happening out in the post-rural countryside? PBS Idea Channel Episode on Tractor Hacking and a recent, optimistic follow-up. “The Man In Seat 61” review of the TranzAlpine, which is much more informative than the official site.